A Swiss electronics manufacturer reckons it has the solution for taking perfect photos in low light with a mobile phone in the form of a new kind of chip for controlling the LED flash. 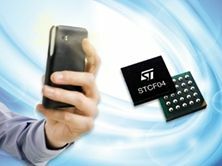 STMicroelectronics has produced the chip complete with a super-capacitor, claiming that it will allow phone flashes to rival the xenon flashes found in handheld cameras. Most mobile phones use an 'always-on' LED flash that can struggle to illuminate its subject. This means your phone has to compensate by using a longer exposure, which can result in images being blurred. The new STCF04 chip allows the flash to produce 40W bursts of light, a marked improvement on the 2W of power most LED flashes produce. The Swiss firm says the additional power will provide a flash equivalent in brightness to an outdoor security floodlight – lets hope this doesn't lead to our subjects going blind in the process. The lightweight chip measures 3mm per side meaning it should be able to squeeze into the slim form factors of today's devices - and at £1.25 per chip it could be a very cost effective upgrade.